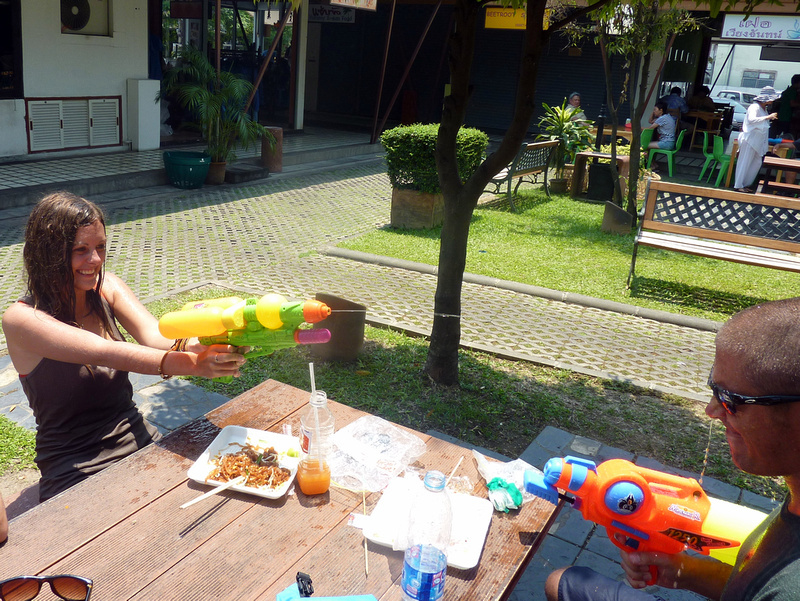 I’ve had many friends over the years rave about how good Songkran is, so naturally I had to find out for myself. I have already attended one incredible festival in Chiang Mai, the Yi Peng Lantern Festival, which I didn’t think could be topped. 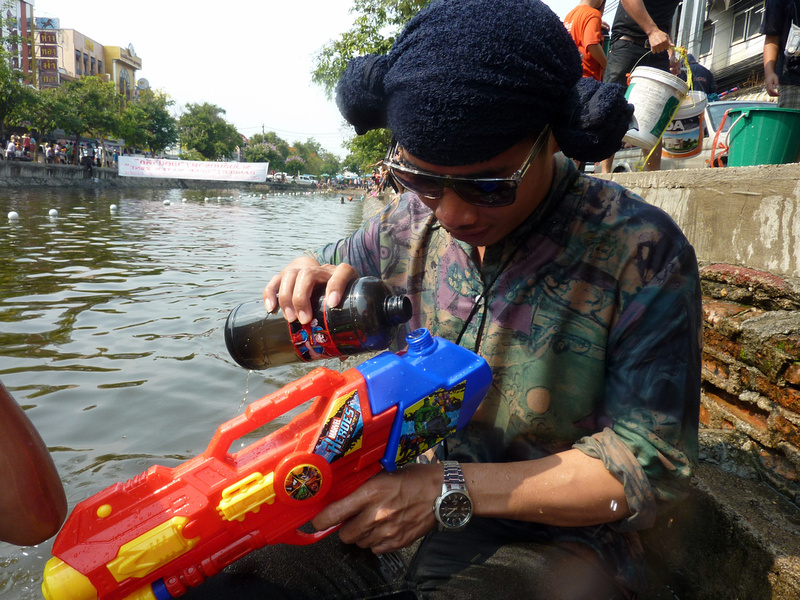 I would have to say that Songkran has blown Yi Peng out the water (pun intended.) 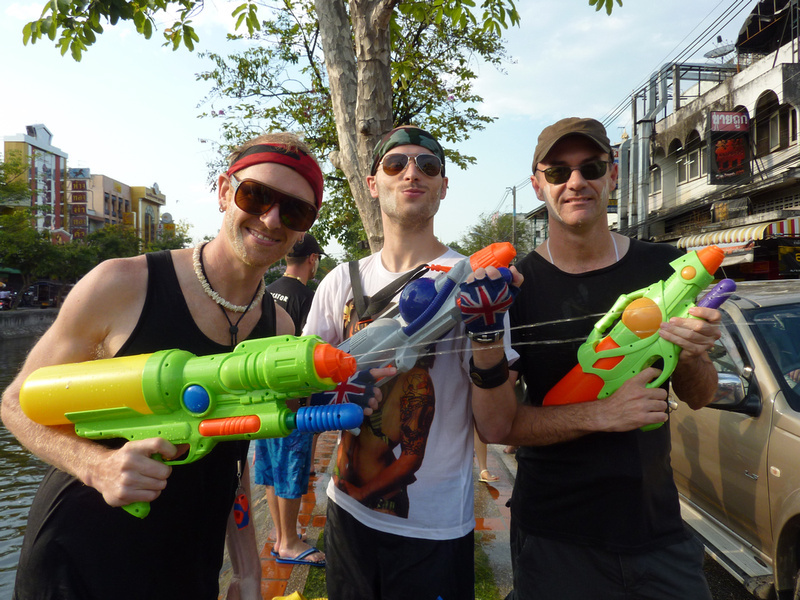 In fact Songkran might just be the best festival I have ever attended. 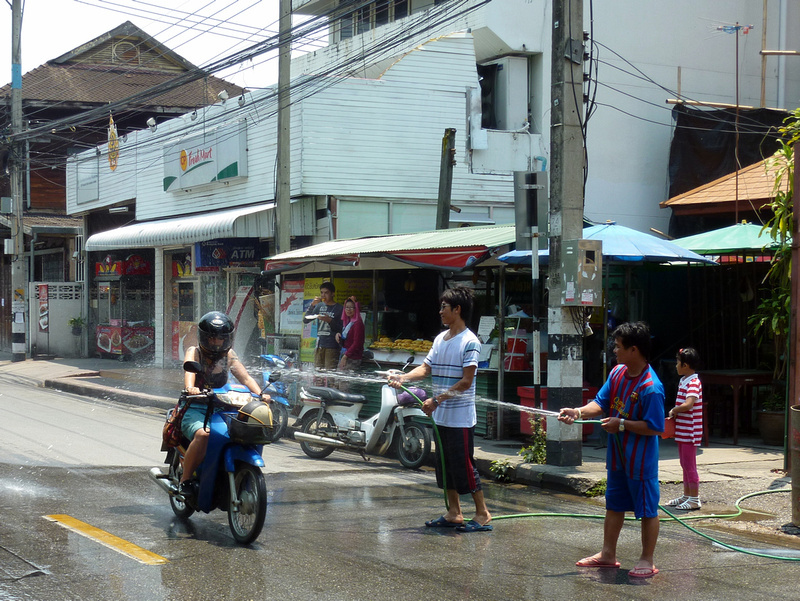 Songkran marks the start of the Thai Buddhist new year, and the throwing of water is a symbol of cleansing for the new year. It just so happens that the Thai new year starts in mid April, which is the hottest time of year in Thailand. Perfect weather for a water fight. 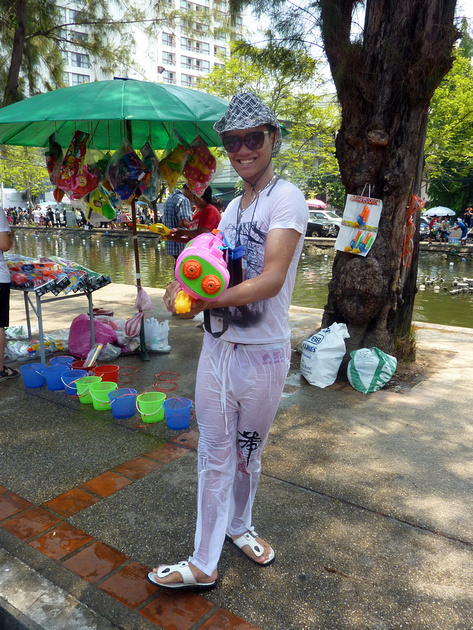 Songkran is celebrated everywhere in Thailand, and in Bangkok there are designated Songkran areas. In Chiang Mai goes on everywhere for four days. All day for four days. I often found myself stopping to take all the madness in, still in disbelief that such a festival can exist. Anywhere else it would make sense if the festival went for four hours and it be contained along one blocked off street. But no, this show is city wide – nationwide – and here in Chiang Mai it is on all day. There is an unspoken armistice at sunset, which is for the most part observed, apart from the occasional stray shooter. 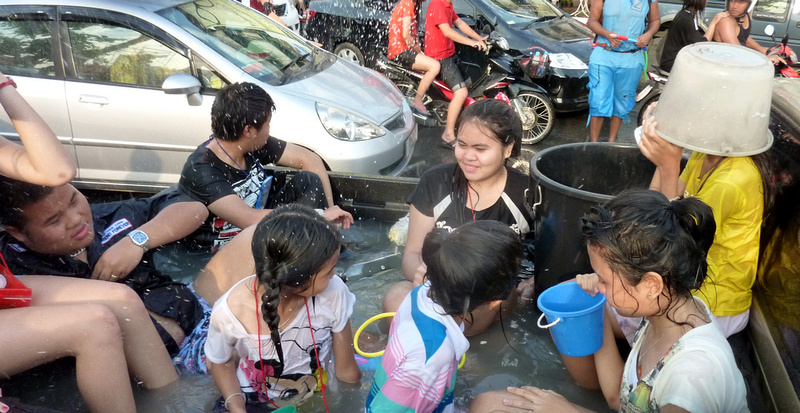 There is lots of laughing involved in Songkran. How can you not laugh when you are assaulted with such lovely smiles as these. Traditionally the water used in Songkran was from water that had been poured over Buddhas for cleansing. The collected water would then be poured on your shoulder with a small cup, like the ones used in this parade. 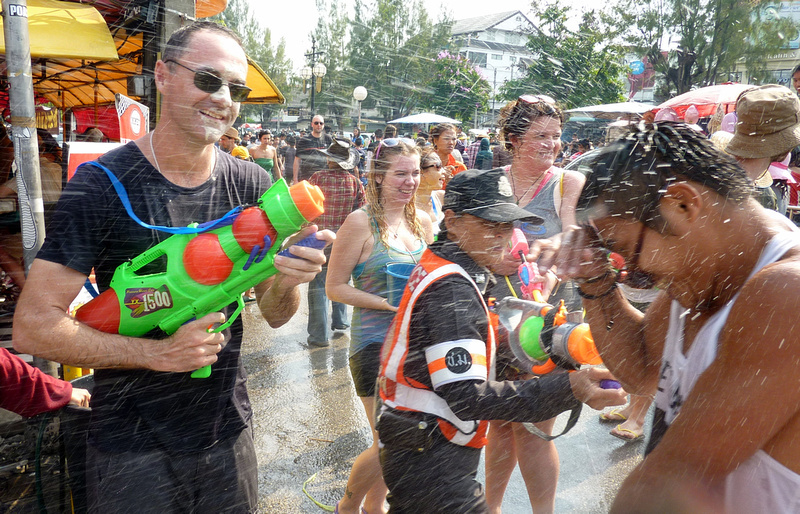 Somewhere along the way Songkran has morphed into a monster waterfight party that rages for four days, with a mashup of international influences. I detected a bit of a Halloween influence, with many young Thais wearing masks like this. 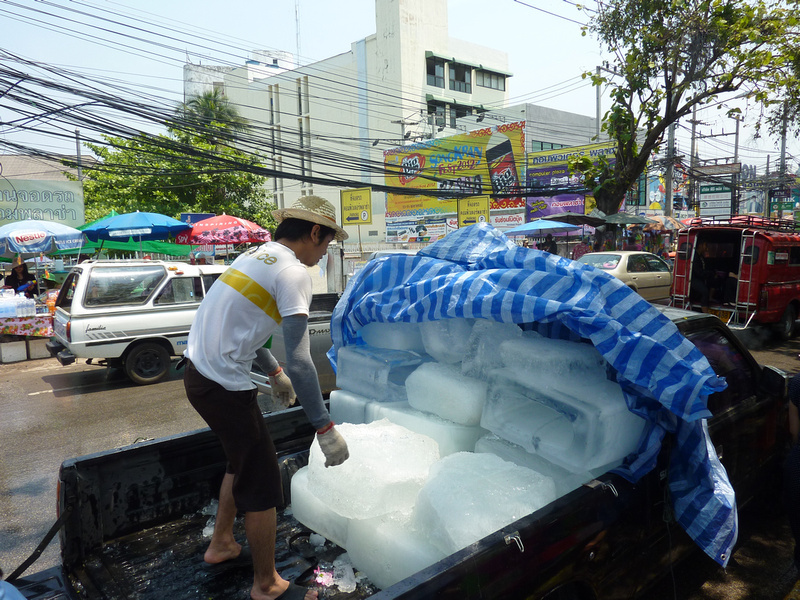 Another feature of modern Songkran is the iced water. All around the moat there are ice dealers, selling ice to the party trucks. Good thing it was 38c every day, which made the buckets of iced water down my back slightly more palatable. 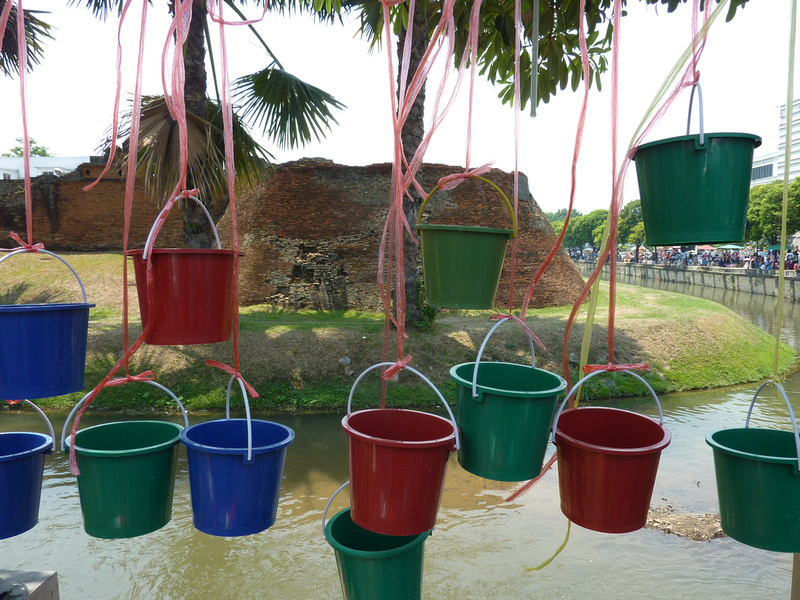 As Chiang Mai has a ready supply of water from the moat, buckets are a popular item. I wasn’t sold on the idea of getting a bucket, but if you are staying in one spot by the moat to douse passing cars it is a better option than a water gun. We were wandering around so the water guns made a better choice. Plus it just looks cooler. If I can give you one piece of advice it would be to shop around before buying a gun. I made an impulse purchase at the first “gun store” I found. Turns out the range of my gun was terrible compared to some of the others on sale. In addition to being continually blessed with water, there is also the chance of getting your face painted with muddy chalk. Apparently it is also good luck. I got a face full of good luck from my man pictured below. The wettest parts of the city was around the moat, so I went inside the old city down some side streets to meet up with my crew to avoid getting too wet. Even in the smallest streets there was no place to hide. You will always find someone ready to water you down. One lunch time our group found a quiet courtyard with no one around. With some takeaway food it was the perfect place to dry out for a while. Dave and Lauren didn’t get the memo about the lunchtime truce. …followed by her bucket full of sweet, sweet, revenge. 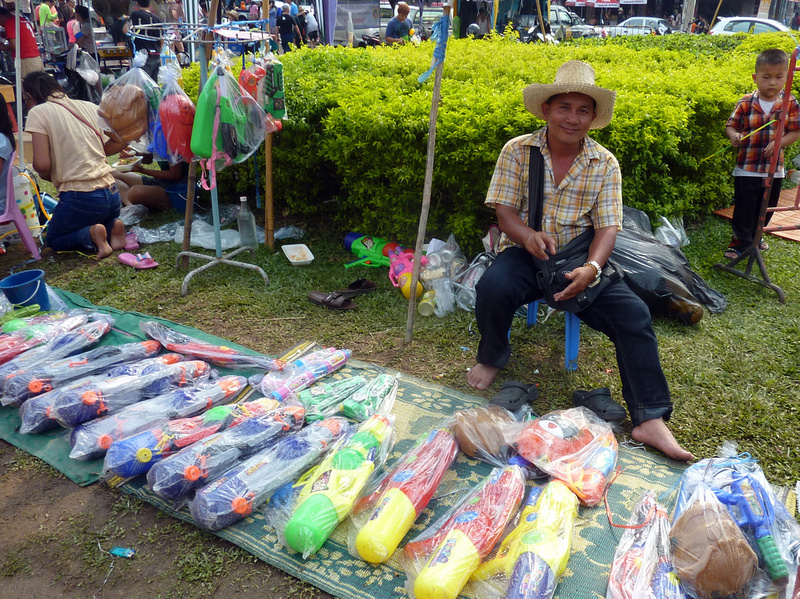 Chiang Mai is supposedly the biggest Songkran city in Thailand, even bigger than Bangkok’s Songkran party. 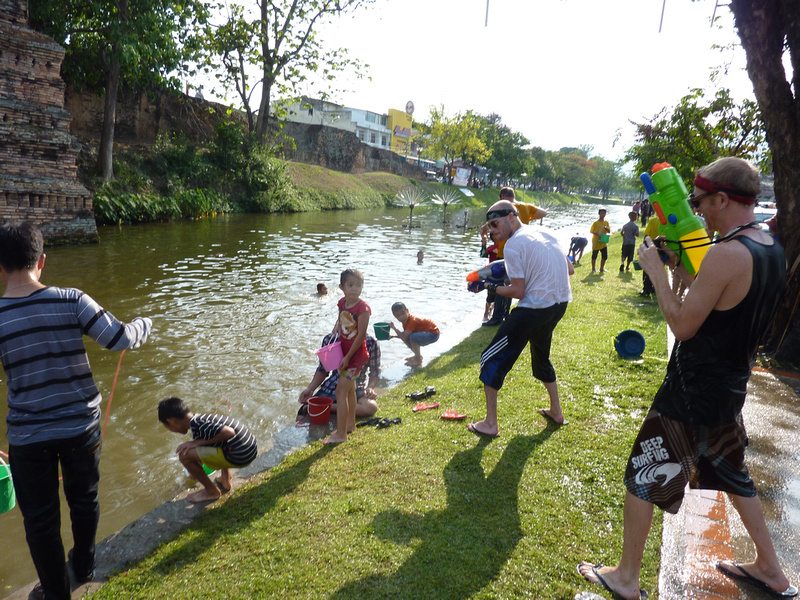 The city layout lends itself to being the perfect Songkran location, with its square moat and road that surrounds it. Each side of the moat is a mile long and all of the roads around the moat are jammed with cars for the entire four days. The slow moving cars made for easy targets, but most of them are armed with ice, so expect an icy bucket of water thrown your way if you pick a fight with a pickup truck. 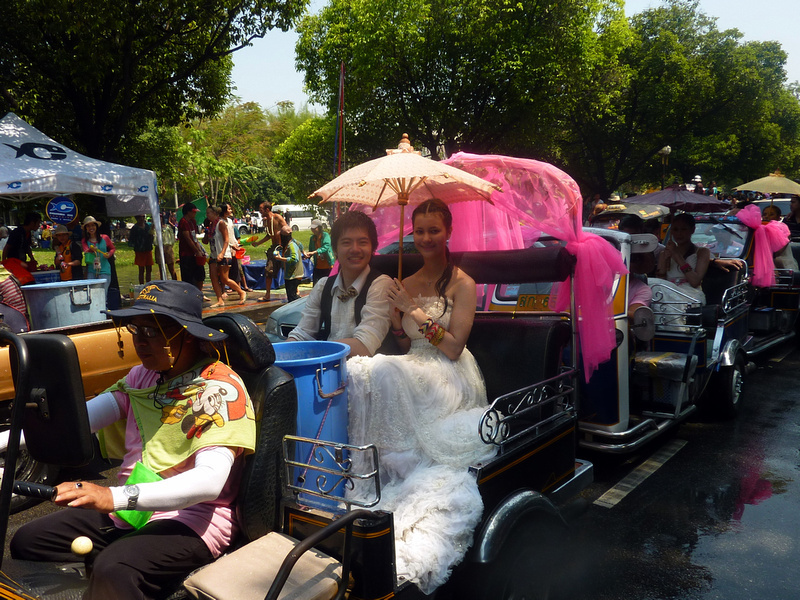 This brave/adventurous couple had their wedding party drive down around the moat in an open Tuk-Tuk. As the traffic is reduced to a crawl for the entire circuit, the road resembles a tailgate party. 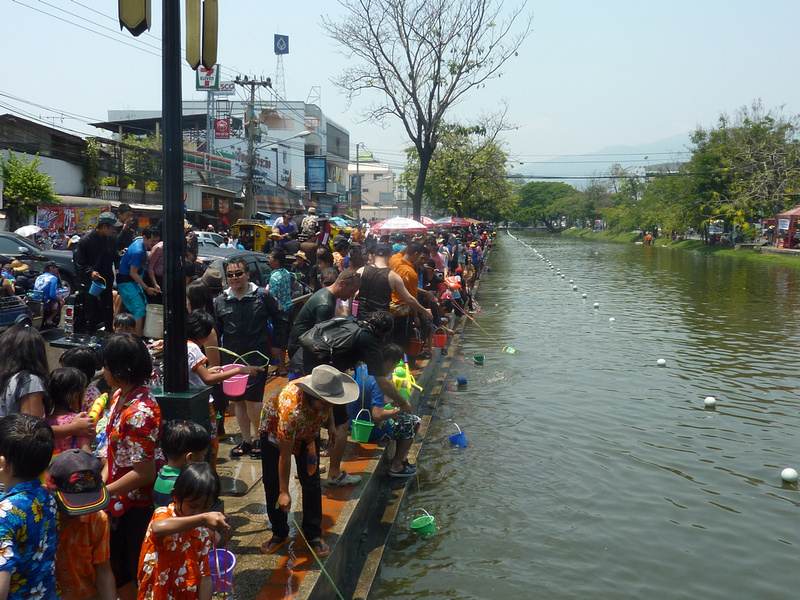 While it’s not the Ganges, the Chiang Mai moat is a murky body of water that I never thought I would go swimming in. So here I am now, post Songkran, wondering what came over me to think it would be a good idea to go swimming in the moat. I was overwhelmed Songkranitis, that is what happened. 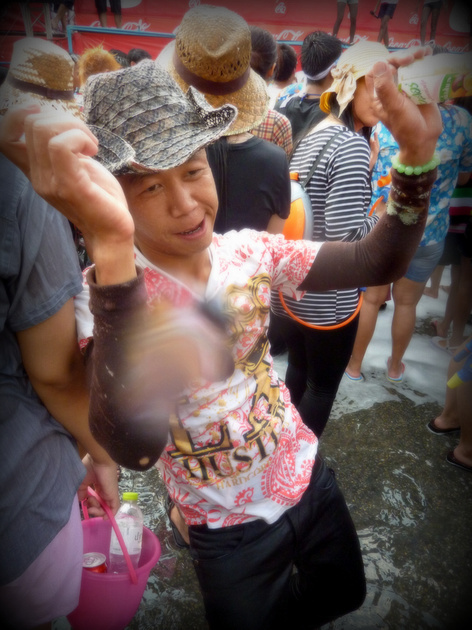 The euphoria of Songkran can make you do some crazy things. 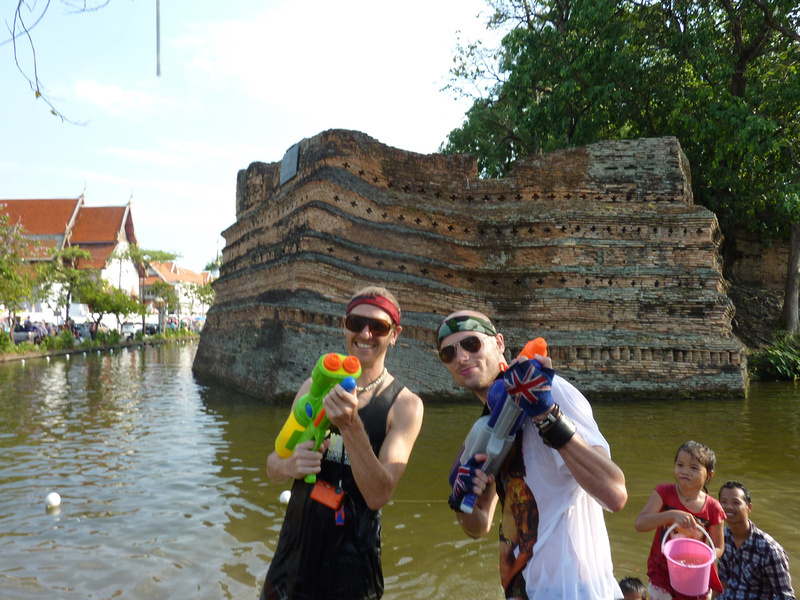 I was by the moat with two friends refilling our water guns. 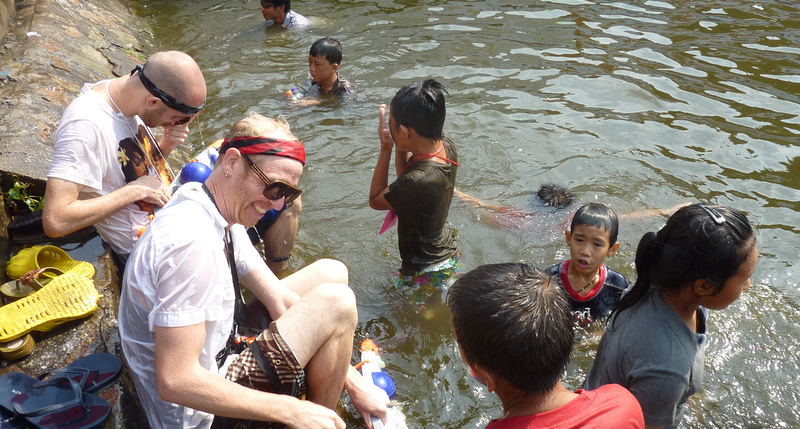 Next thing you know, we are all in the moat playing with the local kids. 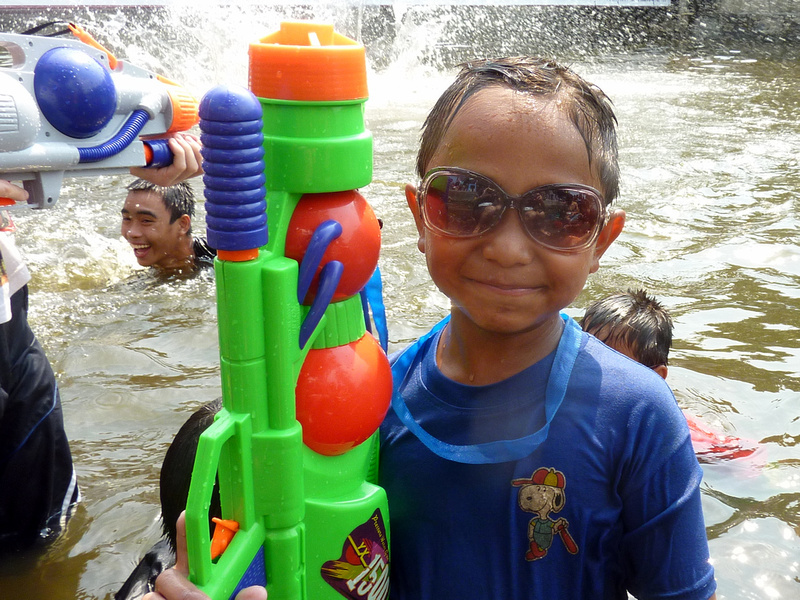 We lent our guns to the kids to play with for half an hour while we sat in the green and murky water. While I was casually wading in the moat water I met this man who was by far best in show for headwear with his Princess Leia inspired towel wrap. If I ever come back to Songkran I must learn how to wrap a towel like this. I got tricked a few times into showing mercy upon little kids and the elderly. Big mistake! 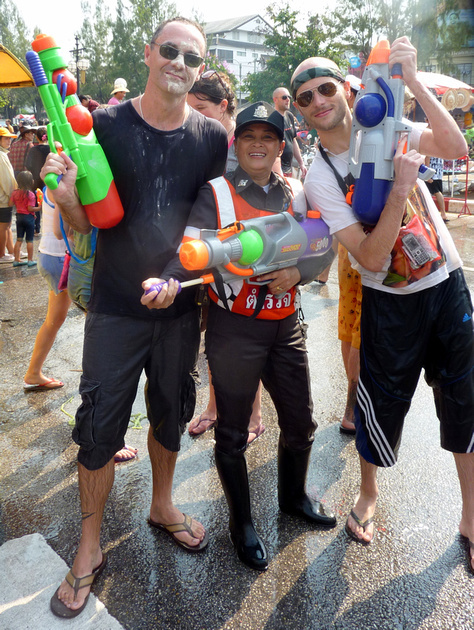 Trust no one at Songkran as I found myself getting wet from all age groups. I was even surprised to find the police in on it. This police woman was AWESOME. 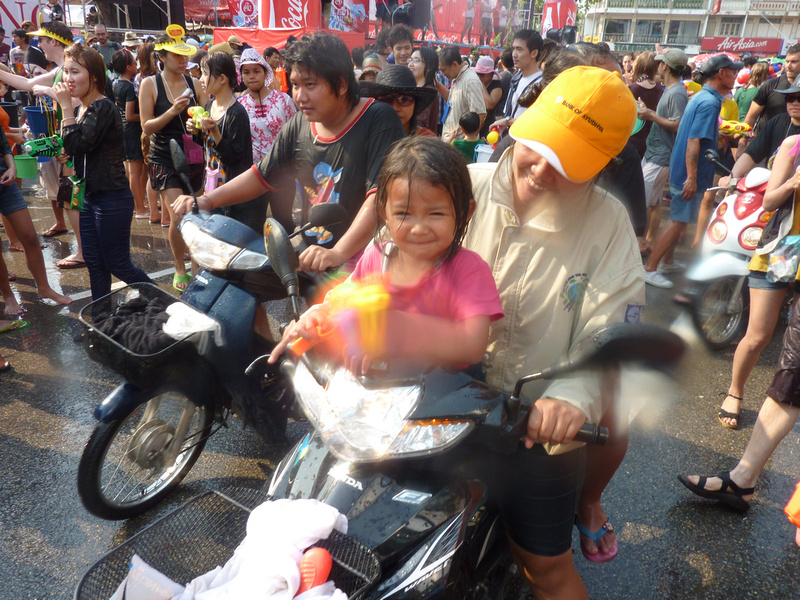 She got such a soaking that she had to take off her riding boots to empty out the accumulated water (not the best Songkran footwear.) I made sure I got a shot in, if only to be able to say I shot a cop. In addition to a DSLR, I also have an old pocket camera that was already on the way out. I decided that I didn’t wan’t worry about trying to keep my big camera dry, so I opted for the pocket camera. My little camera got thoroughly soaked and the viewing screen died for a while. There was also the problem of getting water on the lens and not being able to find a dry square millimetre of cloth anywhere. as a result I was taking photos blind for much of the day and some of the photos literally have watermarks. 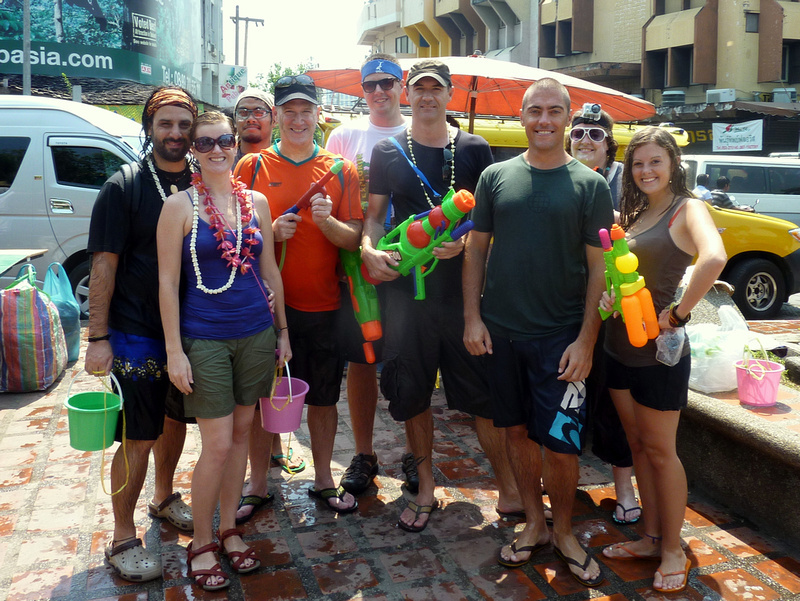 Songkran – Would I go again? After four days of non stop watery fun, I was ready to dry out and get back to a normal routine. 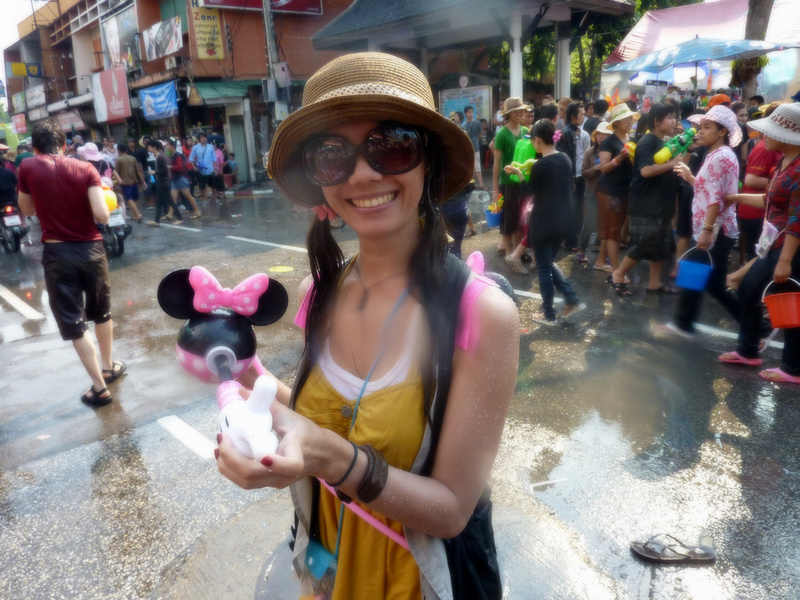 I figured I had experienced enough Songkran to last me a lifetime (I’ve certainly had enough moat water for this life time.) Funny thing is though that the day after Songkran I was walking around the almost deserted streets, wondering if it was all a dream. I also started thinking that it wouldn’t be half bad to do it all again. Part of that might have been that it was 40 degrees celsius when I thought that. Mostly though, it really was that good. We shall see. Read more blog posts about Chiang Mai, and find out which area to stay in Chiang Mai/. Loved this blog! So many fab pictures too! We want to go! Michelle and Mark! Thanks! Yes go, it’s so much fun. Seriously looks like the most fun a person could ever have. AWESOME pics! Sorry you didn’t stay a bit longer 🙁 I was in Thailand the last two years just weeks before it was on but I kept missing it. The Songkran updates from my friends here killed me so i made sure to clear my calendar for Songkran this year. Totally worth coming back for, and a good excuse to come back to Chiang Mai. Aww looks like you guys had an awesome time! Sad we didn’t get to meet up for a proper water fight. You took some great photos! Ours had water spots all over. Lol. Good times. Good times indeed! Sorry I didn’t get to meet up, it was a crazy few days there. I had so many photos with water spots as well, so I was happy I could at least use some of them. You *have* to come back! I like the picture where a little girl aimed at Anthony with a full bucket of revenge. Looks hilarious! That was funny, and I didn’t notice until I reviewed my photos that evening. 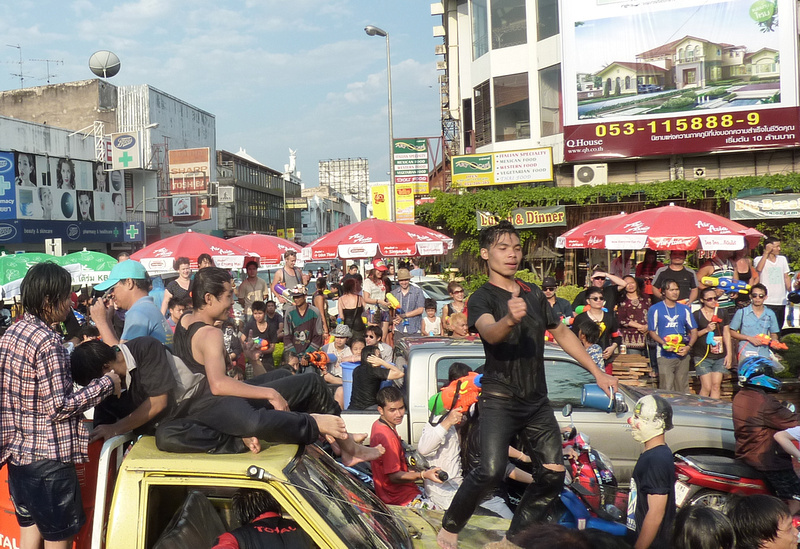 Yes, there are similar festivals on in Myanmar and Cambodia around the same time. I’m tempted to go to another one…so much fun! I am so doing this next year! love the pics and story behind it all…..am going in 2013….not sure whether Chiang Mai or Bangkok…can you reccommend any where to stay…..
Every year I drive pick up car along the road and the moat with friends. 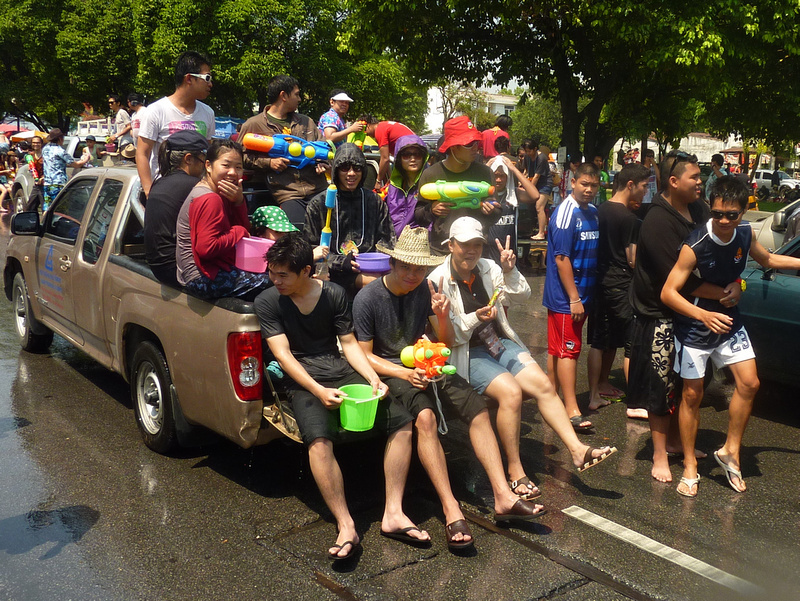 We have a big tank with water and ice and put Thai perfume in there then splash people along the road. 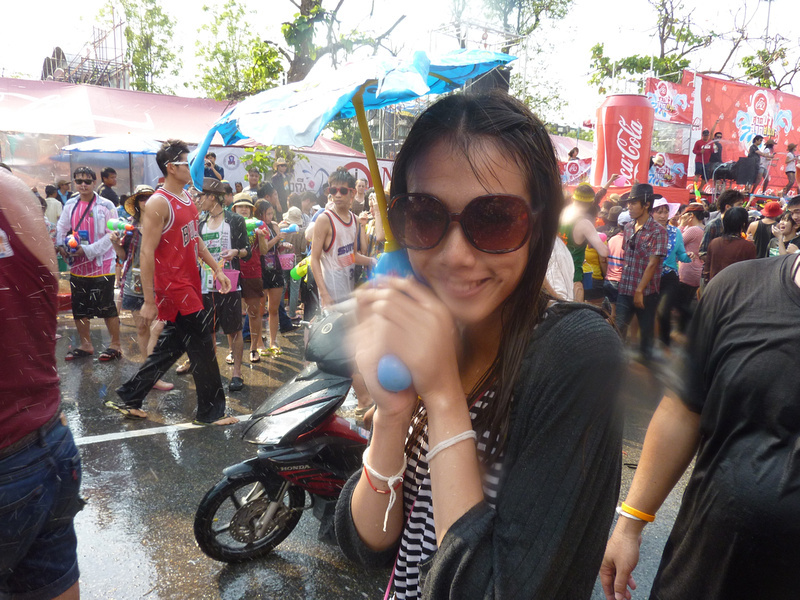 in my opinion Songkran festival make the people friendly to others. WELcome you all to Chiangmai. The look on the little girl’s face is so epic… like she’ll let you know for messing with her! 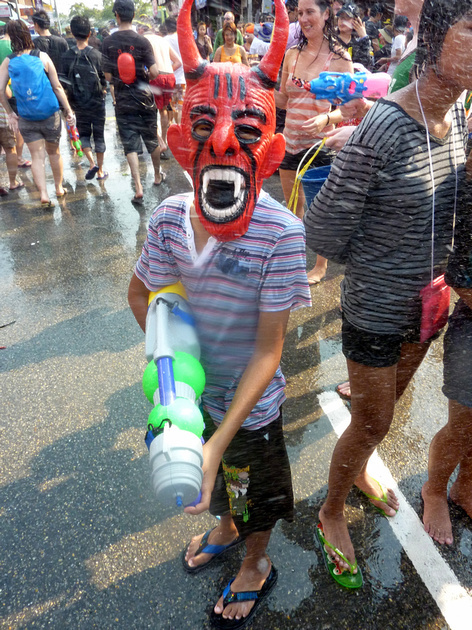 Great images and narrative about Songkran Festival. I attended in 2005 and agree that it was the wildest festival I’ve ever attended. So much fun and also felt embraced by the Thai people during the festival. As my hotel concierge said “If you go outside you will be soaked, not get wet but soaked !” So true. Haha. Songkran is the best. And ice dealers sounds so scifi.